Caldecote v Cranfield. Picture: David Kay. Shefford Town & Campton remain five points clear in the Premier Division supported by Sportsform after they netted win number five on the bounce on Saturday. They won 3-0 at Ickwell & Old Warden who were second at the start of play. George Renney, Sam King and Ross Earl netted the goals to send the home side tumbling down to sixth place in the table. Caldecote v Cranfield in recent action. Picture: David Kay. Now in second are Crawley Green Reserves after they were gifted three points when bottom of the table Sharnbrook failed to raise a side to entertain them at Lodge Road. Whilst just a point behind in third spot are AFC Oakley M&DH who claimed their fourth consecutive home win with a 6-2 victory over Flitwick Town. Elijah Hukin with a brace were joined on the home scoresheet by Mark Smith, Ali Smith, Daniel Kelly and Matt Barnes against Town replies via Will Scutt and Luke Finnie. Sitting just goal difference behind but with two games in are Cranfield United who stayed unbeaten by winning 3-2 at Caldecote. Delroy Philips, Courtney Broughton and an own goal saw them home against replies via Jake Wallace and Ashley Farooqui. Queens Park Crescents who are now unbeaten in their last six outings after winning 3-0 at Riseley Sports thanks to goals from Dominic Parrella, Shauinur Rahman and Chisom Amadi. Also enjoying life on the road were Wootton Blue Cross, 4-2 winners at Wilstead. Matt Nolan with a brace plus goals from Joe Zunguzah and Ross Scott only being replied to twice by Paul Jones for the home side. Elsewhere, Marston Shelton Rovers are still looking for their first home win after being held to a 2-2 draw by AFC Kempston Town & Bedford College. Matthew Eddy and Harry Murray netted for the Rovers and Tom Vandenberg grabbing both of the Town’s replies. Still 100 per cent for the season at the top of the Division One supported by O’Neills are Bedford Albion following their 3-0 win at Cranfield United Reserves. Paul Babbington, Jonti Neal and Stephen Mabberley all found the back of the net. Whilst for second place Wixams it was a 6-2 home victory over Christians in Sport – Jake Dawson with a brace plus a strike from Max Natola shooting them 3-0 ahead before a succesful penalty from Paul Douglas reduced the arrears to 3-1 by the half-time whistle. Second period action saw home goals from Hadley Long, Gareth White and Adam Jellis put the home side 6-1 ahead before Jamie Nolan netted the final goal of the afternoon to make it 6-2. Jumping into third are Henlow following their 3-0 victory at Shefford Town & Campton Reserves who were duly losing their unbeaten record. Luke Hills was the sole destroyer with all three goals. Also winning on the road were Totternhoe Reserves who took their unbeaten sequence to five games with a 3-1 victory at Flitwick Town Reserves. Josh Langlais with a brace and a single strike from Tom Howson were replied to once by Town’s Benn Ward. For AFC Kempston Town & Bedford College Reserves it was a first win of the season to climb out of the relegation zone with a 3-0 home victory over The 61 FC Luton Reserves. Chris Allen, Patrick Worth and an own goal did the damage. Dropping into that zone are Wilstead Reserves following their 3-1 defeat at Cople & Bedford SA. Lucas Banton, Brett Allen and Lewis Fox were on the home scoresheet against a lone reply via Jay Hall. Elsewhere, it was a share of the points for Biggleswade FC Reserves and Lea Sports PSG after they played out a 2-2 draw at Langford Road. John Veal and Nathan George were on the home soresheet against PSG replies via Warren Bell and Callum Jones. Meltis Albion are three points clear in Division Two supported by Hy-Pro after a 2-1 victory at high-flying Kempston Athletic - and Athletic’s first defeat saw them drop to third. Sean Canavan netted a brace for the Albion and Craig Damon replying for the Athletic. Now in second are Houghton Athletic who remain unbeaten on home soil this season following their 9-0 victory over M&DH Clapham Sports. Jordan Thomas led the way with a hat-trick and was joined on the home scoresheet by single goals from Mihail Tudos, Benn Hayward, Ben Starkey, Romayne Sturridge, Adrian Luncasu and Cosmin Miron. Whilst still in fourth spot are Elstow Abbey despite being held to a 1-1 home draw by St Josephs ( Saturday), Josh Spavins netting for the Abbey and Simon Richards replying for St Joes. Abbey are now the only Division Two side to remain unbeaten this season. Atletico Europa won 4-1 at bottom of the table Unite MK Reserves. Moses Gilson with a hat-trick plus a strike from Dee Sayid were replied to once by United’s Michael Afriyie. Whilst into the top six are Sporting Lewsey Park who claimed win number four on the bounce with a 7-0 home victory over Clifton. Chris Gibson with a hat-trick joined on the scoresheet by braces from Luke Lincoln and Jonathan Barnett. 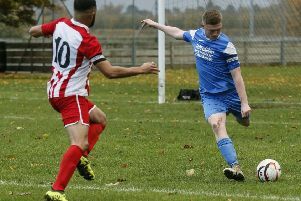 There was a return to winning ways for Luton Leagrave AFC who claimed a 2-1 win over Caldecote Reserves. An own goal plus a strike from Ravi Jessani were only being replied to once by Adam Legate for the visitors. 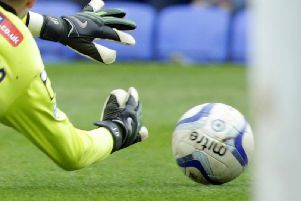 Black Swan (Luton) claimed a fourth straight win with a 5-0 home victory over Marston Shelton Rovers Reserves. Levi Yearwood with a brace plus single goals from Ben Smith, Alex Bithrey and Cullum Wilson brought up the nap hand. For FC Kokan it was defeat number five on the bounce when losing 4-2 at home against AFC Oakley M&DH Reserves. Bradley Duffet with a brace plus Junior Ivy and Ollie Haylett were on the visitors’ scoresheet against home replies from Nathaniel Barimah and Amer Shabir. Whilst CS Rovers were the 2-0 home winners over Sundon Park Rovers thanks to goals from Luke Roddy and Connor Darocha. The Pines ( Luton ) are seven points clear in Division Three supported by Hy-Pro and are still 100% for the season following their 4-3 home win over Dinamo Flitwick. Second place Real Haynes lost their unbeaten home record when defeated 5-4 by FC Polonia, Patryk Gorczyca with a hat-trick plus goals from Marcin Gorczyca and Pawel Seliga brought up the nap hand against home strikes from Billy Flack, Tyler Winter, Hayden Dormer and Harry Mabbitt. Also losing ground on the leaders were third place Shefford Town & Campton A who failed to chalk up their seventh straight win when held to a 2-2 home draw by Thurleigh. Gareth Head and Josh Lummis were on the Town scoresheet against visiting replies from Issac Jones and Alex Horn. Whilst fifth place Bedford Albion Reserves maintained their unbeaten ways with a 5-1 victory at Wootton Village. Guiseppe Lamberti, Jan Bucur, Aaron Fletcher, Josh Emmerton and Gary Townsend all found the back of the net against a Village own goal in reply. The biggest win however went to Flitwick Town A with a 11-0 home win over Real Haynes Reserves. Max Hughes led the way with four goals, Jack Farthing and David Lyons with braces and single goals from Ewan Brown, James Clegg and Nick Wills dishing out the punishment. Whilst Stevington Reserves are now up to tenth following a 4-1 home victory over yet to win Sandy Reserves. Jamie Daniels with a brace plus single goals for Regan Scott and Colm Mcgirl were replied to once by Lee Hunt for the visitors. Elsewhere, there were 4-2 away wins for Lidlington United Reserves and Wixams Wanderers. United took their unbeaten away ways up to five games at Harlington Juniors thanks to a brace from Jamie Rudd plus single goals from Ed James and Carl Pearson against a home brace from Ben Chapman. Whilst the Wanderers, with a hat-trick from Michael France and a goal from Craig Brown, won at Square FC whose two goals were netted by Kevin Beales.